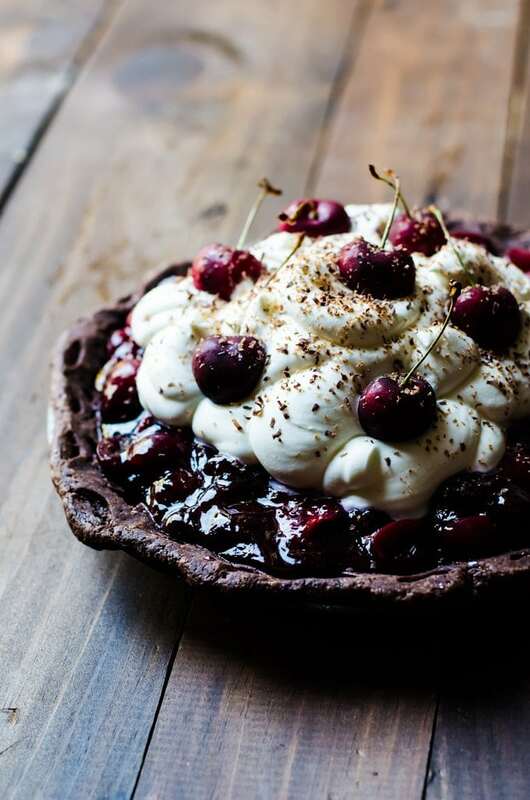 Chocolate, cherries, and the lightest whipped cream meet to create a mouthwatering pie. 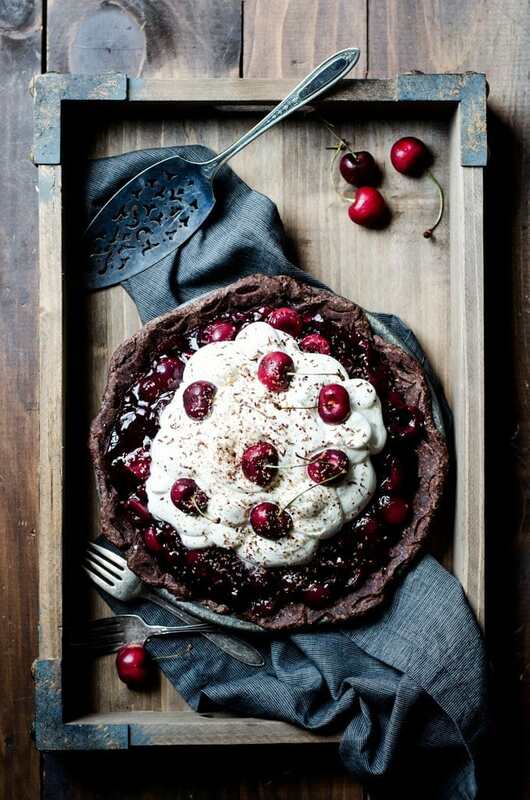 This black forest pie looks like a showstopping, laborious dessert, but is a quick and easy pie with very little baking involved! I used to be a traditionalist when it came to Black Forest pie. It started with my friend Erin who lived in Germany for years before we met (and has since moved there permanently) and would make the most incredible Black Forest cake. I imagined anything else that claimed to be “Black Forest” flavored or inspired would be inferior. Obviously since making my Black Forest funnel cake and Black Forest ice cream cake I have changed my mind about that. Now, I can’t wait to try anything Black Forest. I go out of my way to hunt it down. I cannot get enough. I know I’ve probably said it a million times before, but chocolate and cherries together is the most incredible flavor combination. But when you add light as air fresh whipped cream to the mix, it becomes something that is so hard to resist. Why even bother trying. I mean, really. 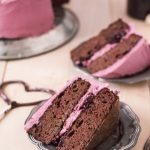 This is why Black Forest Cake – and now this Black Forest Pie – is such a favorite with so many people. 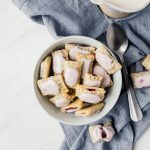 What I love about this recipe is that you can easily break up the steps over a couple of days if you want. I like to make my pie crust and sometimes even the filling a day ahead. And the only time this pie is in the oven is making the crust which gets blind baked for about half an hour. The filling is made on the stove and poured in when cool and that’s it. If you are feeling particularly lazy, you can skip the ganache (I only use it about half the time I make this pie and it is just as good without) and use store-bought whipped cream. Of course, if you go that route, you can’t add in the kirsch. Not sure where to find kirsch? Most larger and medium-sized liquor stores carry it. In a pinch, you can also try cherry infused vodka or brandy. 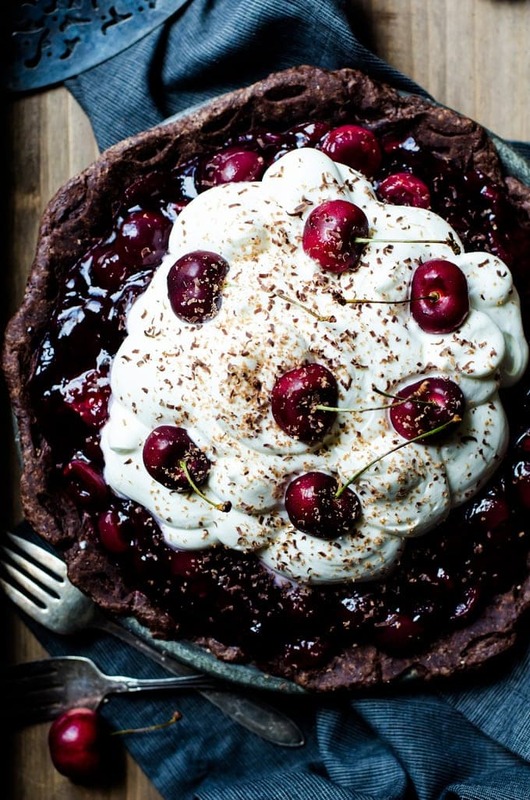 No matter what, this Black Forest Pie is everything. 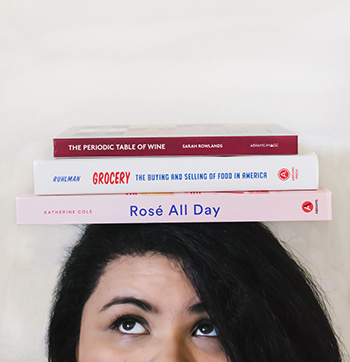 Now excuse me while I go have myself a fourth – I mean second (obviously) slice of pie! 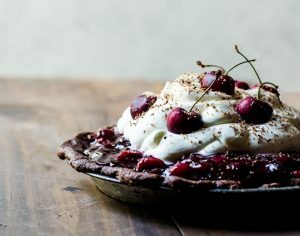 A mouthwatering and showstopping Black Forest pie with a rich dark chocolate crust, chocolate ganache, fresh cherry pie filling, and topped with the lighest whipped cream. In a food processor, mix together the flour, cocoa powder, sugar, and salt together. Pulse until combined. Run the food processor and add the yolk, then slowly add the water. Stop at 1/4 cup and test the mixture. It should look like wet sand, but come together when pressed. Add another tablespoon as needed. Turn the pie crust dough onto plastic wrap and form into a disc. Chill in the refrigerator for at least 2 hours, preferably overnight. Melt the chocolate for the ganache, if using. Stir in the heavy cream until it is well combined. Set aside until needed. Take out the dough and roll out into a circle 1/4 inch thick. Place in a pie pan fold in the edges under the dough so it is flush with the lip of the pan. Decorate as desired. Cover and freeze for 30 minutes to an hour. Preheat the oven to 350 degrees F.
While the crust is freezing, mix together all the ingredients for the filling into a pan and heat on medium high. Cook until the cherries soften and juices have thickened considerably. Set aside to cool to room temperature. Remove the pie crust and cover with parchment paper, then fill with pie weights or dried beans or rice. Bake for 25 minutes. Remove and discard the parchment and weights. Bake for another 5 - 8 minutes. Set aside to cool to room temperature. Brush the bottom of the pie with the ganache. Pour the cherries into the pie crust. Chill in the refrigerator. Beat the heavy cream, powdered sugar, and kirsch until iit forms stiff peaks. 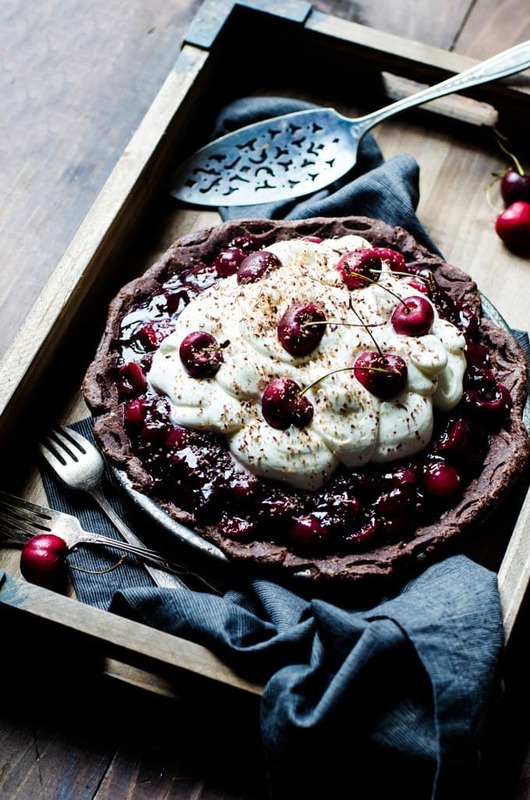 Top the pie with the whipped cream, then top with the shaved chocolate and fresh cherries. Best stored chilled in an air tight container. This truly looks incredible – i’m legit drooling over the keyboard as I type this. I’ve been wanting to make something cherry centered, and what better than a black forest pie? YUM, and gorgeous photos! I don’t think I’ve ever made black forest cake or pie. 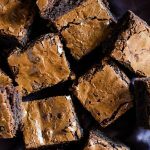 I have tried it before from bakeries and they are always amazing! I need to try making it at home and starting with this pie. Oh my goodness, this is absolutely gorgeous! I’m drooling over here!